Levels 1-3 are information zones. Level 4 is the tipping point. Levels 5-7 are influential zones. 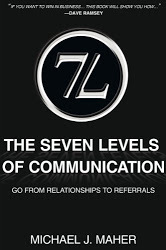 By doing business from levels 4-7 alone, you can increase your active referral base and solely grow your business without spending a penny on ads or mail campaigns. I love it. As a business owner you learn one lesson pretty quickly - cash is king. The more if it you can keep the better you are. And with 1-3% returns on most ad campaigns they are more of a liability than a wise investment. Write Power notes every day and don't forget an actionable P.S. This is only a sampling - and to even decipher what it all means I highly recommend you read it. Drop me a note sometime, I am grateful you are here! That a terrific synopsis of (7L) Andrea! Thank you for reading and thank you for being so dedicated to self-education in the spirit of sharing and helping others. Please let me know how I can help. Thank you Michael for stopping by and reading my blog! You are my first commenter and I was rather taken back when I read that you had left such a kind comment for me. I want to read your book again and imagine I am being coached as I go through each step - getting outside my comfort zone and getting in touch with people everyday is where I get stuck. What suggestions do you have for getting out of my own way? Thank you again for stopping by, and for authoring such a useful book!